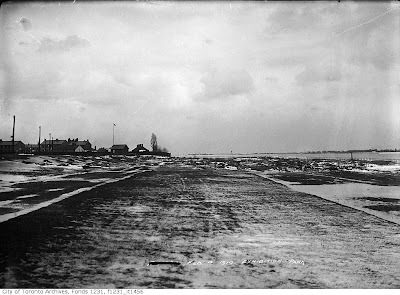 above: Feb.4, 1914 - looking eastwards along the lakefront, where Lakeshore Blvd. runs today, south of the Exhibition. Lake Ontario and the Toronto Islands can be seen at the right. About 60 years later, Ontario Place would be built out in the water at the far right. 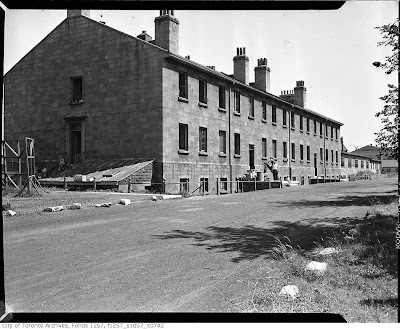 At left can be seen many of the buildings that once surrounded the Stanley Barracks, on what are now the CNE grounds. click on photos to enlarge! 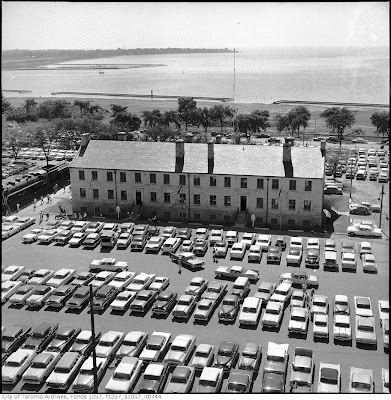 above: Stanley Barracks with Lake Ontario and the island in the distance, prior to the construction of Ontario Place, probably taken from the old Shell Tower in the 60's. CN steam locomotive 6213 is seen on display at the far left. This 4-8-4 Canadian National Railway steam locomotive was built in 1942, removed from service in 1959, and was given to the the City of Toronto in 1960. It was on display at the Exhibition Place grounds, sitting at the east side of the Stanley Barracks. below: Stanley Barracks, looking from the north-east. Note buildings that continue west into the right rear distance. above: same view, Apr.30, 2009, now with 6213 at the left and the tugboat Ned Hanlan seen at the far right. above: Apr.30, 2009 - 6213 with coal tender attached at rear. above: same view, May 29, 2009 - 6213 has been pulled back from her fenced pad, and separated from her coal-tender, which is now seen sitting at the left. above: May 29, 2009 -view of vacant pad, looking south. above: Apr.30, 2009 - looking northwards towards the rear of the coal tender, when the locomotive was still in the fenced pad. In the foreground is seen a wooden rowboat inscribed Ned Hanlan . above: May 29, 2009 - closer view of 6213 at the right and the coal tender at the left, both sitting on rigs, being prepared for their move to the John Street Roundhouse, near the CN Tower. The locomotive is said to weigh 160 tons! Workers are installing scores of bogey wheels under its steel frame. Note in the foreground, where the square chunks of wood are laying, was where the rowboat Ned Nanlan, seen above, had been. I'm not sure what happened to this boat. above: May 29, 2009 - view of the rear of 6213, sitting on its blocked frame, as wheels are being inserted under the frame in preparation for its move downtown. Now that the engine and coal tender have been separated, note the coal auger which has now been exposed at the rear of the cab. It took coal from the rear tender and pulled it forward, feeding the firebox up in the engine. above: May 29, 2009 - 6213 and her coal tender, now separated and sitting side by side on different trailers. The above photos are by R.Bobak. 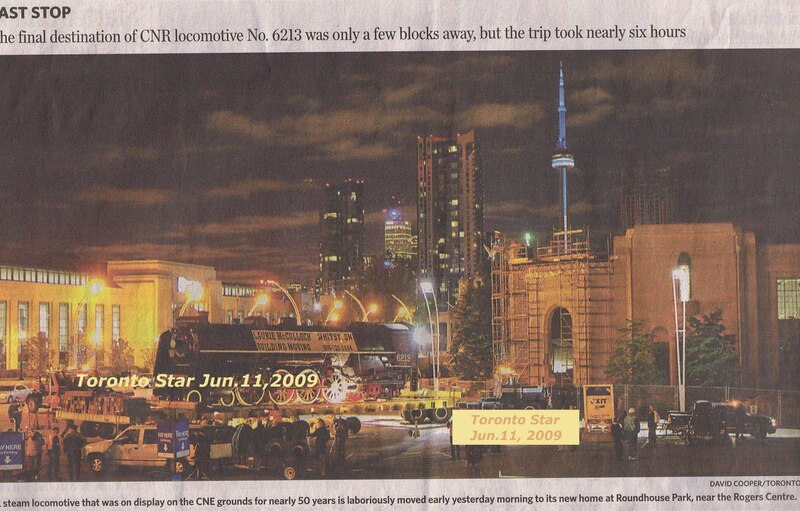 above: photo from the Jun.11, 2009 Toronto Star showing locomotive 6213 on her trailer, passing by the Automotive Building (at R) on her way to her new resting place downtown at Roundhouse Park. 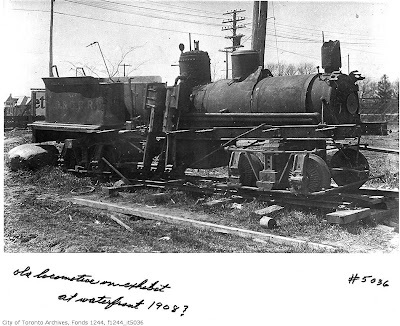 above: The caption only says "old locomotive on exhibit at waterfront, 1908? ", but who knows where this little gem actually stood?! Was it at the waterfront downtown; or somewhere at the Exhibition grounds? It looks like the tender has " G. & O. R.R." written on it (it's hard to tell); where was this steam locomotive from? Its also possible that the writing may be "O & Q R.R. ", in which case it could mean this was a steam engine from the "Ontario and Quebec Railway" - a precursor of the Canadian Pacific Railway!! There are Victorian houses seen at the upper left, which could be in Parkdale on Tyndall north of Springhurst; if so, the locomotive was sitting just south of the tracks, east of Dufferin St., inside the CNE grounds (prior to the tracks being lowered along here). The above old black and white photos are from Toronto Archives. The La Riviera Motel in Niagara Falls, Ont. was demolished on May 14, 2009. It was a two storey block structure with a coreslab concrete second floor, probably built in the 60's. It stood on the north-west corner of Buchanan Ave. and Ferry St. Above: same view, May 19, 2009, after demolition. above: same view, May 15, 2009, the structure has been reduced to rubble. below: May 14, 2009, view of the Riv from Ferry St., looking at it from the south-west. above: same view, May 14, 2009, the heavy demolition is underway. The motel was knocked down by the end of the day. below: May 1, 2009 - a full view of the rear of the Riviera, as seen from Spring St., looking south. The Capri Restaurant is seen in the right distance. below: May 11, 2009 - looking at the east-side of the Riviera Motel from Buchanan Ave., the windows, doors and interior already demolished. above: May 19, 2009 - same view; some wood debris is all that remains of the old La Riviera Motel. Another Falls motel has fallen. "Why such a heavy police presence at the hospital groundbreaking ceremony on April 28? Police officers outnumbered peaceful protesters, and they even had two police horses. Isn't this overkill? Protesters were by far all seniors. Doesn't the Region and the Niagara Health System recognize and value the fact that we have a right to protest health cuts, restructuring, the net loss of health services across Niagara and the folly of spending $749 million of taxpayers' money on the new hospital, especially since it is a P3 (public-private partnership)? Protests, public debate and calls for transparency are what keep democracy alive in Canada. There are serious flaws in the current restructuring that will adversely affect citizens across Niagara now and into the future. We will not be intimidated into silence. " Who is intimidating these opponents? The region?!! What is it with people blaming the NHS (Niagara Health System), or the LHIN, or the P3 finance model? Why aren't they mentioning the Ontario Liberal Party's health-care lies and broken, duplicitous promises? Where is the mention of Dalton McGuinty's or Jim Bradley's, or George Smitherman's or Kim Craitor's role in regards to the new hospital? Why aren't they protesting the McGuinty Liberal's ideological, oppressive, police-state-like policies, which promote lack of choice and ban competition in Ontario's Liberal-run monopoly health care system? Many whining local Liberals can't seem to fathom that their own Liberal Party's fascist health care regime has conspired against them. They never imagined in their wildest Liberal medicare nirvana wet dreams that they themselves would fall victim to their own unaccountable Liberal demagogic nightmare. Talk about being hoisted by your own petard. The whining "opposition" seems to be concerned only about the location of the new hospital - not about the stark fact that McGuinty's Liberal health care monopoly simply steamrolled over the illusory health care rights of the citizen taxpayers of south Niagara! There is no choice in the Liberal health monopoly for patients. McGuinty's Liberals doubtlessly calculated that the concerns of south Niagarans were expendable. And, once again, no one is discussing what the problem is (state-run monopolist health-care); they're just arguing about where the hospital should be! The solution for the so-called "opposition" is what - to build the new hospital in Thorold, instead of St. Catharines? That's it, problem solved?! Seriously? The NHS and the LHIN are marching on the direct Liberal orders of Dalton McGuinty and David Caplan. Put the blame where it legitimately belongs - on Liberal statists who practise Liberal Healthcare Duplicity! It is indicative of the siege mentality of this McGuinty Liberal government and its 'police-state' health-system that a rather banal (to all but media-hungry politicians) occasion of a hospital-construction-site unveiling would have called for such high obvious (and needless) police presence. Overkill, indeed - as is the Liberal's ideological monopoly-stranglehold on health care itself. "I can appreciate people's excitement about the new hospital for St. Catharines. However, I think some may be a little naive. The new hospital is not everything we are given to believe. Of the 375 beds in the hospital, not all are slated for St. Catharines; in fact there will be fewer than the number of beds we currently have at the General. Other beds are slated for the rest of the region - if people can make it there before passing away from a heart attack or giving birth! The original budget for the hospital was $300 million; it is now a staggering $759 million. How are we going to pay for this? What services in Niagara will be cut to finance the hospital? With emergency rooms in Fort Erie and Port Colborne being scaled back to urgent care centres, already long wait times in St. Catharines will become even longer, endangering lives. Premier Dalton McGuinty currently funds Ontario hospitals below the rate of inflation, pushing 50 per cent of Ontario hospitals into deficit and forcing them to cut services. This must stop! Ontario health care must be properly funded. And we must be given the full truth about cuts and costs." The actual cost of the Liberal's new St. Catharines hospital, amortized and paid for by taxpayers over some 30 years, is going to be over $1.5 billion !! Healy brings up some good questions, mentioning waiting lists, health care finance cuts, forced service cuts, underfunding, and hospital deficits in the Liberal's state-run health monopoly, which could very well endanger lives. Will Liberal MPP Jim Bradley bother to publicly respond to Flack's earlier or Healy's above concerns? What - all Ontario health-care wait times are decreasing??!! Are you kidding? Isn't the above May 5, 2009 St. Catharines Standard headline just fabulous? So, what do Liberal health-care monopolists such as Health Minister David Caplan, or local St. Catharines MPP Jim Bradley, have to say about the report in the Apr.30, 2009 St. Catharines Standard (see: Shiny new hospital, same old monopolist problems) where Cancer Care Ontario claimed that chemo therapy wait times in Ontario have INCREASED by 10% since 2007?! Is that wait-time increase a lie? Caplan now says that "the Ontario Hospital Associaton is reporting to us that in fact wait times are decreasing, and in fact, people are geting better service and better care." Is that a lie? Is a day-long ER wait what Jim Bradley's Liberals point to as 'better service and care'?! Has Liberal MPP Jim Bradley even bothered to publicly respond at all to the St. Catharines Standard's Apr.30, 2009, or Apr.18, 2009 stories? Is any one even asking Good Ole Jim for a response? The question is, are the Liberals hiring ENOUGH real nurses? 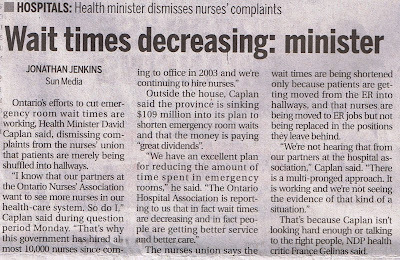 Similarly, Caplan's claim (in the May 5, 2009 St. Catharines Standard) that he's "continuing" to hire more nurses is unproven, vague rhetoric. How will we verify and measure David Caplan's claims (made in the St. Catharines Standard, Mar.6, 2009) that his Liberal government will be hiring a FURTHER 9,000 MORE nurses?! As I wrote in Shiny new hospital, same old monopolist problems, it's good thing, too, that Jim Bradley (who you can bet will be reminding us in future campaign pamphlets of his super-human efforts to personally build the new St. Catharines hospital, despite having said ten years ago, in the St. Catharines Standard, back on May 29, 1999, [see: Liberals underfund Niagara health-care while denying link to high patient death-rate in St. Catharines] that we "can't easily get by with one active-treatment hospital") has wisely allowed for his new regional hospital to have spacious hallways - all the better to pack waiting patients into. Regarding the issues of the ER-to hallway-wait-time-shuffle, and the nurse position-shuffling, Caplan now says "We're not hearing that from our partners in the hospital association... we are not seeing evidence of that kind of a situation." Having stated all this - Caplan's secretive Ontario Liberals continue to deny the Ombudsman from having FULL indepedent, investigative access to the Liberal's health care monopoly. It's hard to cite evidence when you can also block any investigation!! It's hard to know when and whether unionized or politicized special interest groups are telling the truth, in order to better their positions of influence in their cozy health monopoly. Patients continue to be shuffled around as Liberals shuffle fast and loose with their authoritarian, failing health care monopoly. "A former president of the Canadian Medical Association declares in a new U.S. television ad that patients here are languishing, suffering and even dying on wait lists, as a conservative lobby group ramps up the debate over health reform in the United States. A pro-medicare advocate calls the $1-million ad campaign by Conservatives for Patient Rights (CPR) on CNN and Fox News an "outrageous" distortion of the reality in this country, and has drafted an open letter to U.S. President Barack Obama refuting its claims. A B.C. medical broker who is also working with the U.S. group, however, says Americans must know the pitfalls of "single-payer" systems like Canada's. Dr. Brian Day, who runs a private surgery clinic in Vancouver and served a controversial term as head of the medical association, is featured in the first CPR ad. It warns against government-controlled health care in the United States. It cites alleged problems with the British and Canadian systems. "Patients are languishing and suffering on wait lists," Dr. Day says. "Our own Supreme Court of Canada has stated patients are actually dying waiting for care." The ad is a pre-emptive strike in the brewing debate over Mr. Obama's plan to reform health care to ensure that the 45 million Americans with no health insurance now gain coverage. The President has specifically stated, though, that he was not contemplating a Canadian-style system. CPR, which plans more television spots, has already posted interviews with Rick Baker, the Vancouver medical broker, and Canadian patients relating their wait-list horror stories on YouTube. "It's quite galling and quite outrageous, quite frankly, to have the past president of the Canadian Medical Association misrepresenting Canada's health-care system in the United States," said Michael McBane, spokesman for the Canadian Health Coalition, a union-backed advocate of the medicare system. "I just really think it's important that the American people realize Brian Day is not the voice of Canadians." In its letter to Mr. Obama, it also cites the checkered past of Rick Scott, the founder of CPR. He was ousted in 1997 as head of Columbia/HCA, a huge health-care company, after the firm paid $1.7-billion to settle charges alleging it had over-billed federal and state health programs. Mr. Baker, whose Timely Medical Alternatives helps Canadians obtain speedier treatment in the United States, said his own motivation for co-operating with the group was in a way selfish. If America adopts health care similar to Canada's, he will have nowhere to send his clients, he said. "We refer to America as Canada's ‘other' health care system," he said. "It's like the release valve on a pressure cooker -- the U.S. availability. So if the U.S. were to adopt our dysfunctional system, where would I send my Canadian patients who are dying?" He said his customers have included six people who were told by their Canadian doctors they could die before their number came up on the waiting list for various treatments. The broker has agreed to do similar interviews with another free-market health lobby group, and is scheduled to address U.S. congressmen in Washington next month at CPR's request. He said he will also be featured in a 30-minute advocacy infomercial that the organization is negotiating to run on American television. When CPR sent Gene Randall, a former CNN and NBC correspondent, to Canada to conduct interviews, Mr. Baker linked him up with some of his clients. They included Don Neufeldt, a Bradner, B.C., poultry farmer who related how he faced a wait of more than two years for surgery to fix a potentially fatal heart arrhythmia, then decided to pay to have the operation in Oklahoma City almost immediately. "It was worth paying the money," he says in one CPR video posted on YouTube. "I'd pay it in an instant again." It's equally "galling", isn't it, that unionist McBane fails to note that he himself is no "voice for Canadians" either - he's just a health-monopoly-status-quo-pushing statist, whose special-interest group would likely prefer seeing Obama Democrats "improve" the American system to the point that U.S. health care is just as outrageously bad as Canada's. Tilting to a non-competitive, patient-choice-limiting, private-medical-insurance-banning, state-funded model is a prescription for failure and forced state-dependence; Obama has wisely (thus far) chosen not (see: Canadian single-payer health-care not good enough for Obama) to follow Canada's sicko socialized, state-run, supposedly-universal health-scare system - but that's not to say that Democrats couldn't conjure up something even worse, which, frighteningly, is entirely possible. Ontario's Liberal government-run socialized health monopoly (which Liberal Premier Dalton McGuinty has already stated [see: Was Dalton McGuinty fibbing about Ontario's Liberal healthcare spending during the Sep.20, 2007 CTV televised Leaders' Debate? ] already eats up HALF of Ontario's entire budget) literally DEPENDS on nearby American available health-care capacity. Having the American system as a safety-valve allows Canadian socialists, and Liberal statists, such as St. Catharines Liberal MPP Jim Bradley, to pretend and to propagate the deception that state-run universality works. We have seen Ontario's Liberals increase taxes while decreasing funding to their hospitals - while at the same time criminalizing the option of patients being able to plan and pay for their health care outside of the failing state-run monopoly. It is the Ontario Dalton McGuinty Liberal's monopolist health-care fascism that ought to be criminal. President Obama should consider meeting with Dr. Brian Day to fully appreciate Day's perspective of the Canadian experience. Obama is welcome to read the disaster stories of Liberal state-run health-care manipulation in Ontario in my essay Liberal Healthcare Duplicity, An Ontario Overview 2003-2007 .